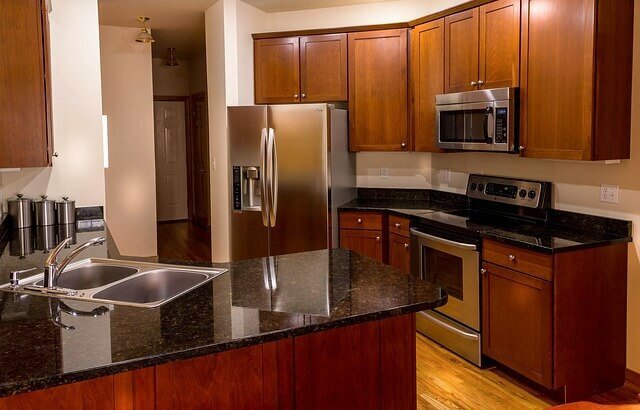 Granite countertops maintain their beauty with professional cleaning and care. Champion Chem-Dry granite countertop renewal extends the lifetime of countertops too! Our granite countertop cleaning service targets porous areas of your countertop to destroy bacteria and prevent the spread of toxins and allergens. The service includes sealant to block harmful germs and dirt and help recreate the original shine of the granite. Overall, Champion Chem-Dry technicians equip themselves with green cleaning products and first-class equipment to provide an eco-friendly and effective service for your countertops and home. Our granite countertop cleaning solution eliminates dirt, germs and toxins without harsh scrubbing or chemicals that might harm the surface. Because the Chem-Dry solution contains no chemicals, our granite countertop renewal leaves your home healthier and cleaner than other services. We won’t leave residue behind. Our technician uses our very own residue remover to ensure the surface is free of all cleaning elements. We seal the deal, literally, in the next step of our granite cleaning with a little countertop sealer. The sealer dries in just a few minutes and lasts for months to provide an impenetrable shield from germs and bacteria. After cleaning and sealing are complete, we polish the surface to revitalize your granite countertop and leave a beautiful glow. Questions? Call (813) 780-8464 or fill out our FREE ESTIMATE form for pricing information. Low-moisture carpet cleaning removes stains, allergens and embedded dirt without soap or chemicals. Champion Chem-Dry provides professional cleaning for upholstery and furniture in your home or business. Certified, all-natural rug cleaning removes dirt and debris from area rugs and decorative rugs. Tile cleaning, stone cleaning and grout cleaning targets bacteria and breeding grounds for germs. Commercial carpet cleaning for businesses in Tampa, FL, including office, restaurants and more. Trusted stain removal techniques more effective than DIY methods and safer for you and your carpet too! Our service utilizes innovation and expertise to remove harmful pet urine odor and stains from carpet. We’re on Facebook: “Like” Champion Chem-Dry for cleaning tips, local Tampa news and online deals! Are you a past customer? We would love to hear from you! Please write a review here. Thank you so much!